For the LORD God is a sun and shield; the LORD bestows favor and honor; no good thing does he withhold from those whose walk is blameless,~Psalm 84:11. I normally don’t post back to back. No worries, I’m not starting a new trend. I won’t be posting this upcoming week or weekend. Or next week. Busy days ahead…mostly filled with fun. I did want to encourage you before I take a break…yes. I wanted you to be on the lookout for surprises from heaven. God is so generous. He blows me away! I’m praying miracles and tremendous blessings your way. If God gives good gifts, where are mine? Is that what you’re thinking? I used to think God was blessing everyone but me. I had some time in the wilderness. I like to call it the 7 levels of hell. It was no fun. During that season I watched others celebrating life. Some of those days I was either sick, watching my mum die, helping my family sustain through many challenges, etc…and well the verse above didn’t seem to apply. I had days where I’d say, “God I know you’re good. I can’t see much good in today.” I didn’t see much goodness. Pain has a way of clouding perspective. I saw a string of trials, challenges, tragedies, tears, sorrow, disappointment…Hindsight is 20/20 eh? 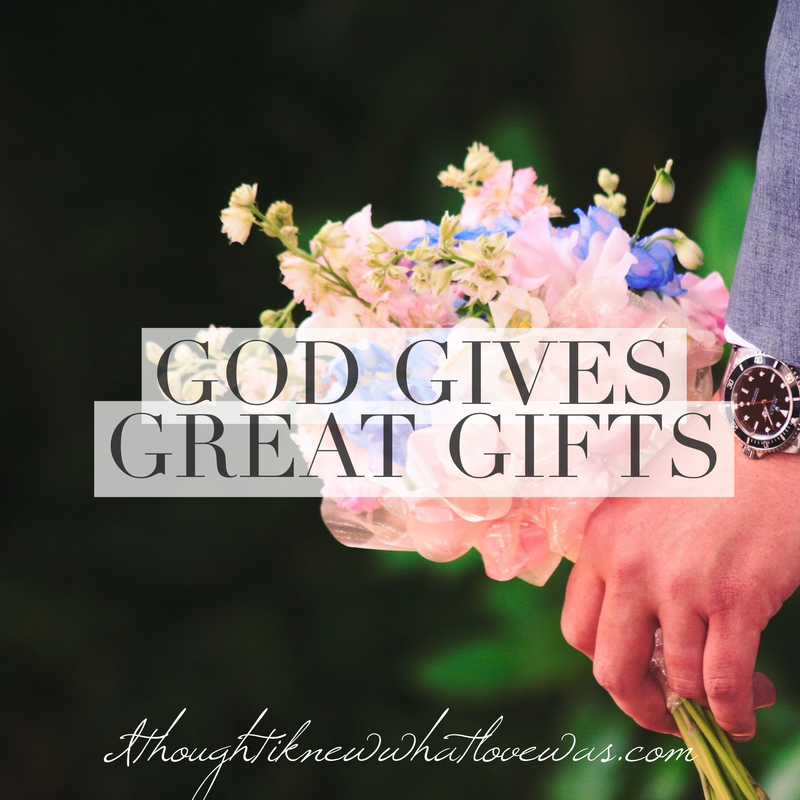 Here’s what I learned about God’s gifts. You ready? 1. God is the greatest gift, relationship with Him. Some of the sweetest, most intimate moments were in the most intense trials of my life. We are best friends for life. When you’ve been in the fire with God, no one can convince you He’s not real. God kept my mind during things I know I would not have made it through without Him. 2. Unbelief, murmuring, and complaining block many blessings. God doesn’t delight in complaining. Unbelief blocks the flow of heaven. Everything in the Kingdom works by faith. When I started saying what He was saying, giving thanks for what I did have, I saw such a radiant light shine in the darkness. I saw gifts I had never seen before. 3. Gifts don’t always come in the packages you expect or how you expect them. I prayed for a long time for kindred spirits, covenant friends, intercessors. God provided them in the most mysterious ways. Divine appointments with strangers and for some instant love/friendship. Some are old enough to be my parents or grandparents. Age doesn’t matter. Distance doesn’t matter. They are knit in my heart. I love them with my heart and spirit. 4. God goes for the wow factor. It’s exceedingly and abundantly above all you could ask or imagine. I’ve heard people say, “If it’s too good to be true, it’s probably not for real.” Well…not so with God. He longs to bless your socks off. He’s not offering crumbs off the table. He gives custom gifts. It’s perfect for you or the need you’ve expressed. He is beyond lavish. 5. He will wait until you’re ready. Some gifts are weighty and require maturity. You wouldn’t give your 2yr old the keys to your car. They wouldn’t know what to do with them. He also won’t give us things or relationships to replace Him or for us to find our identity in them or things we can’t handle. I stopped praying, “Please give me,” and started praying, “God prepare me. Refine my character.” I want to be an excellent steward and representative of heaven. I have a guy associate who wants to be married. He will not pursue getting to know anyone. I asked him, “How will you ever get married if you avoid getting to know women?” He had no response. I’m not sure who told singles that angels would sing over their future mate or they’d hear the audible voice of God…I truly think if God places someone on your path it’s okay to have coffee. Coffee is not a marriage proposal, last I checked. Though Chiptole may be (it’s a funny story of a nice man who invited me to dinner then proceeded through his wife must haves checklist. Yep…Chiptole may be a bad choice (insert laugh here)). 7. If you ask and are being led by the Spirit, He will let you know if it’s not for you. Not everything is to be pursued. If it’s not for you, God is so awesome He will tell you or show you. I pray, “God is this from you? If not, let it pass on through.” Or “Show me who this person really is.” He’s so faithful to answer. Yes! It saved me from getting married to the wrong person in my early twenties and from taking many assignments that weren’t mine to take or even recently from continuing on in a relationship where God said, “This isn’t the right man for you.” He’s great, yet our lives are headed in two different directions. I’m called to international ministry. He wants to be local and is starting med school. We are good as friends, not as two that would become one. How can two be joined together lest they agree? Two visions leads to division. Truly believe God connects people who are better together than apart, they build together. They have similar vision. 8. God doesn’t forget promises. Some things He spoke 10 years ago are just now starting to surface. He’s faithful. 9. Say what God says until you see what God says. Our words matter. Decree and declare His words. I hope you’re on the lookout for great things from above. God gives awesome gifts. He’s the greatest gift. He’s the center of it all…so worthy! I bless you. Seeking Him first is the best. He’s outstanding. You are SO loved and lifted up continually. Write to you in a few weeks!!! This is so inspiring .. Your teachings are making my FAITH grow…. GOD is good and thank you for sharing. So happy to know you’ll be having a break – PRAYING YOU ARE REFRESHED, that all the days would be saturated in The Extravagant ONE! Thank you for pouring out pouring out pouring out . . . your emails come JUST when I need encouragement! He is so GOOD! Love to you! Big hugs too!!! God bless you! Today and always!! Thanks for writing this up! it is so true! May you sense His many blessings for you this day! Erin, I don’t mind your back to back posts. I look forward to your posts very much, your words always touch me. Christ has truly blessed you with His gifts.